Landers Chrysler Dodge Jeep Ram of Norman, Oklahoma has a great selection of Jeep Renegades for sale! The all-new Jeep Renegade is sure to take your breath away! The Renegade is a compact SUV, meaning it has all the capabilities of Jeep while also being the right size for a big metro area like Oklahoma City. The 2019 Jeep Renegade will make improvements on an already extraordinary car by introducing new front and rear bumpers and an improved engine. Alongside these new features are the safety, capability, and awesome technology which makes the Renegade one of the most versatile cars on the market. Design: The exterior is where the 2019 Renegade will see the majority of its changes. Of course, the Renegade will retain the classic seven-slot grille. Alongside the classics, however, come the changes. On the 2019 model, Jeep has moved the front fascia lower, changed the headlights and moved the foglights to the bottom of the fascia. On the rear of the car, Jeep has restyled the Renegade’s bumper and added a new pronounced handle, contrasting the hidden handle which was featured on the 2018 model. New, remodeled tail lights will also feature on the rear of the car. Performance: The 2019 Renegade will have all the capabilities you would expect from a Jeep. With iconic 4×4 capability, you will have the ability to take your vehicle into even the most difficult situations. 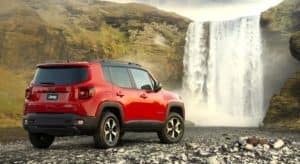 Standard Renegade models will arrive standard with a powerful 2.4-liter Tigershark engine that has an output 180-horsepower and 175-lb-ft of torque. The all-new Firefly 1.3-liter Global Small Engine is the more powerful upgrade with 177 horsepower yet 200 lb-ft of total torque. No longer equipped with the six-speed manual transmission, the 2019 Jeep Renegade gets an updated nine-speed automatic instead! With this upgraded performance and the pre-existing 4×4 capability, you will truly be able to drive anywhere and do anything in the 2019 Jeep Renegade. Technology: Not only does the 2019 Jeep Renegade have a ton of design and performance updates, but it also comes equipped with some of the most fun and current tech to keep you connected and safe while on the go! For starters, a 5” touchscreen comes standard in the new Renegade, but you can upgrade it to 7” or even 8.4” for total customization. Safety features like ParkSense, Parallel and Perpendicular Park Assist Plus, adaptive cruise control, and front parking sensors also ensure your safety whenever you’re behind the wheel of your new 2019 Jeep Renegade. Looking to take home a 2019 Jeep Renegade? 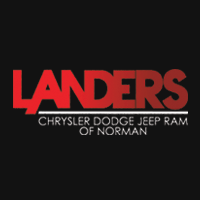 Landers Chrysler Dodge Jeep Ram of Norman has got your back–click here to contact us for more info!